Preview 4 full tracks from the new Julien Kasper Band CD in the audio player on the right. Get it now at Amazon.com or iTunes. Julien and his band have just released their third album, "Trance Groove", which showcases Julien’s strongest playing and writing to date. The textures, grooves, and sounds are rooted in blues/rock and funk while interplay of the musicians, vivid harmony, chromatic sensibility, and intertwining themes reveal high level jazz players displaying a rare marriage of virtuosity and musicality. The album features a guest appearance by Hammond B3 organist T Lavitz (of the Dixie Dregs, Widespread Panic, and Jazz is Dead). Julien Kasper is an extraordinary guitarist who tempers his fiery playing with an unerring sense of melody and composition. His music blends elements of rock, funk, blues and jazz with natural flow and passionate intensity. 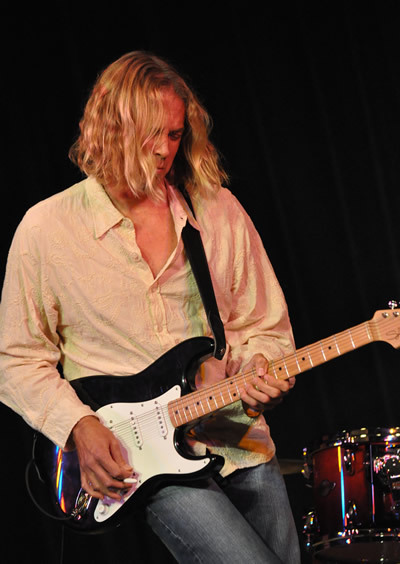 In addition to his own band, Julien has performed and recorded with Mighty Sam McClain, the Bruce Katz Band, and Pat Ramsey, and toured with Michelle Willson. Sign up for the Julien Kasper email list to receive occasional news and event updates.